I’ve not slowed down since December. I am wanting to keep this momentum so I’ve initiated a bunch of projects for myself. I’m excited about this year! I’m going to discontinue about 30 prints starting next week! There are a lot of prints that are old that I’m simply not excited about anymore. So I’m going to offer them priced as low as $3 to get rid of them! And would you be interested in grab bags? Yes? Okay then grab bags are coming! 🙂 This will start next MONDAY! I’m also going to raise the prices of my prints. This has been a tough decision that has come with a lot of thought. I meant to do it last year, but just couldn’t make myself do it. I’ve only raised my prices one time in FOUR years. And paper, ink, supplies have all increased in price over the years. I’m going to raise the price of my small prints from $15 to $20 and include free U.S. shipping. Shipping has been $3.25, but now it will be included in the price. The large prints are changing from $22 to $28 with free U.S. shipping. Shipping in the U.S. for large prints was $4.50 but it will be free now. 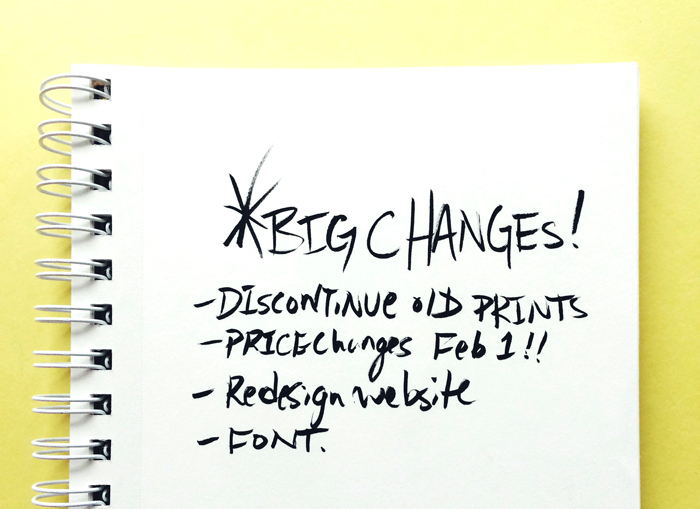 Prices will change February 1st. I’m still undecided about the price of the teeeny prints. Whew! I’m going to be honest. I’m nervous about it, but I know I need to do this. Running your own business is tough. If you find it’s easy, then please tell me everything you are doing right! HA! It would be so much easier to be sneaky about it, hoping you wouldn’t notice. But that didn’t feel right to me. Here’s hoping you understand. Onto more fun news, Dave and I are redesigning my website and it’s going to be awesome. I’m not sure when it will go live, but hopefully soon. And I’m starting to work on a font! I’m so excited about this! I’ll be sure to share process photos over the next few months. Almost forgot – YES I’m doing a hymn calendar for 2016. I will start on it much earlier for wholesale orders. love it! I’m excited about everything you do!